Heard good things about the Sleep Science mattress brand and wondering if they have a mattress for you? This established company offers memory foam and latex mattresses in a range of firmness levels to suit all sleepers. Keep reading to find out if they have one to suit your needs. Our top Sleep Science mattress is the Ara 13-inch memory foam mattress, which provides an extremely soft sleep surface with added breathability and excellent edge support, ideal for side and back sleepers who enjoy a plush feel. Our runner-up pick is their 10-inch memory foam mattress, Sleep Science’s most universal mattress designed to provide a supportive and comfortable surface for all sleep preferences. Sleep Science mattresses are designed by South Bay International Company and are sold by Costco, both online and across the country. The brand offers a number of different models all with different features to appeal to a variety of sleep preferences and they also sell adjustable bases for a completely customised sleep experience. Sleep Science has been making their memory foam mattresses for over two decades: for a more in-depth look into some of their popular models and their features, take a look at our review of 8 of their best mattresses available online, below. The Ara 13-inch memory foam mattress is a medium-soft mattress that provides a luxuriously plush sleep surface, ideally suited to side and back sleepers who enjoy the contouring sensation of memory foam. 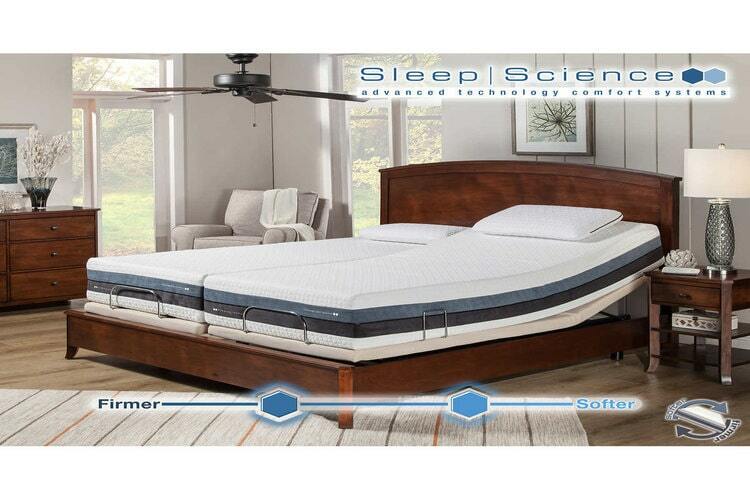 With their Air Comfort layer and Air Channel base, this mattress is designed to allow air to easily circulate through the mattress for a cooler night’s sleep and added breathability. The Ara mattress is a medium-soft mattress best suited for side and back sleepers. It’s a soft, supportive sleep surface that provides an almost weightless sleep. 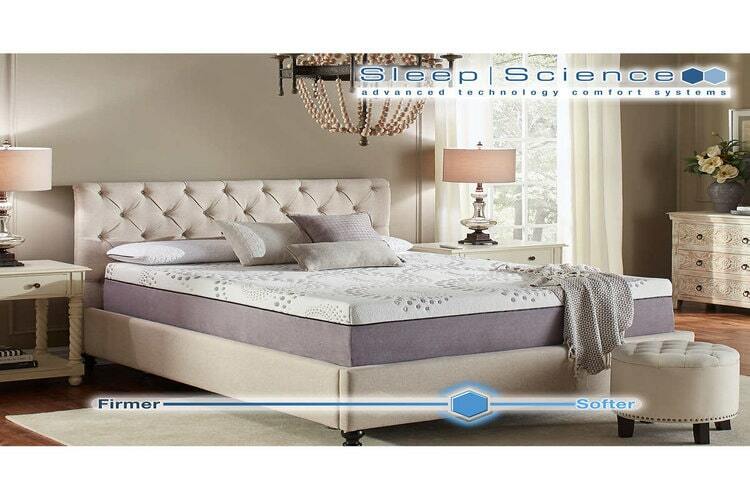 The mattress also features Sleep Science’s Wedge Support System for additional edge support around the mattress. The memory foam layers are designed to relieve pressure points and support the body for a more neutral spine position, while the Air Comfort layer allows air to flow more easily through the mattress and dissipate body heat for improved circulation and a cooler sleep surface. The plushness of this mattress makes it best suited for back and side sleepers, whereas front sleepers may find the mattress too soft to be comfortable. Overall, this is a luxury mattress perfect for sleepers who enjoy a pillow-soft sleep surface that cradles you as you sleep. For a similar alternative option, you might like the Amerisleep AS5 Independence, a soft memory foam mattress ideal for side and combination sleepers who enjoy the supportive, traditional contouring of memory foam. Sleep Science describes their 10-inch memory foam mattress as their most universal mattress, providing a supportive surface designed to suit most sleepers. This also makes it ideal for couples who have different sleeping preferences. With a medium feel, this mattress should provide a comfortable night’s sleep whether you sleep on your back, side, or front, with an open-cell Air Comfort layer that improves the breathability of the mattress for a cooler sleeping environment, all night. 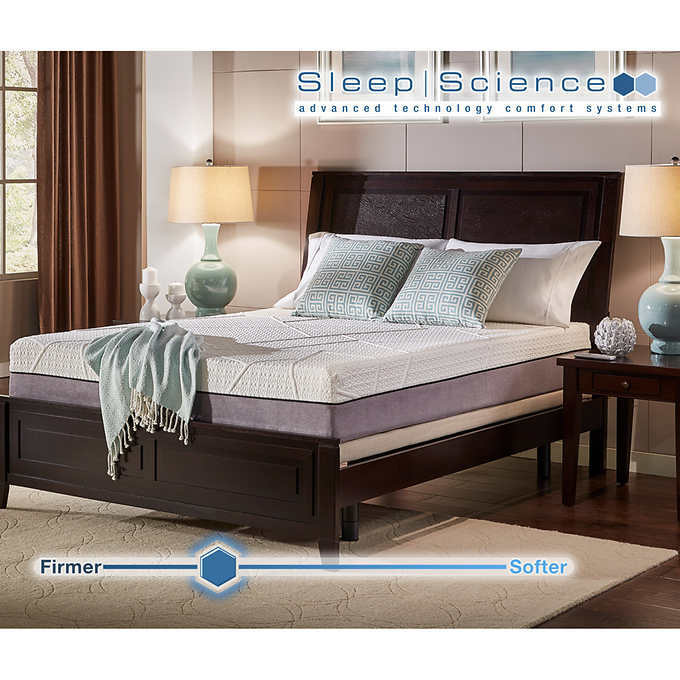 The Sleep Science 10-inch memory foam mattress is constructed from a top layer of 100 percent viscoelastic memory foam, followed by a 2-inch layer of Air Comfort Foam made from an open-cell material to improve airflow and temperature regulation. The bottom layer consists of a 5-inch layer of high-density polyurethane base foam for added support. Described as a medium mattress with firm support, the 10-inch memory foam mattress is ideal for most sleepers, meaning it should provide a comfortable sleep surface whether you prefer to sleep on your back, side, or front. What’s more, the open-cell Air Comfort layer helps to keep the mattress temperature neutral, preventing you from overheating throughout the night. 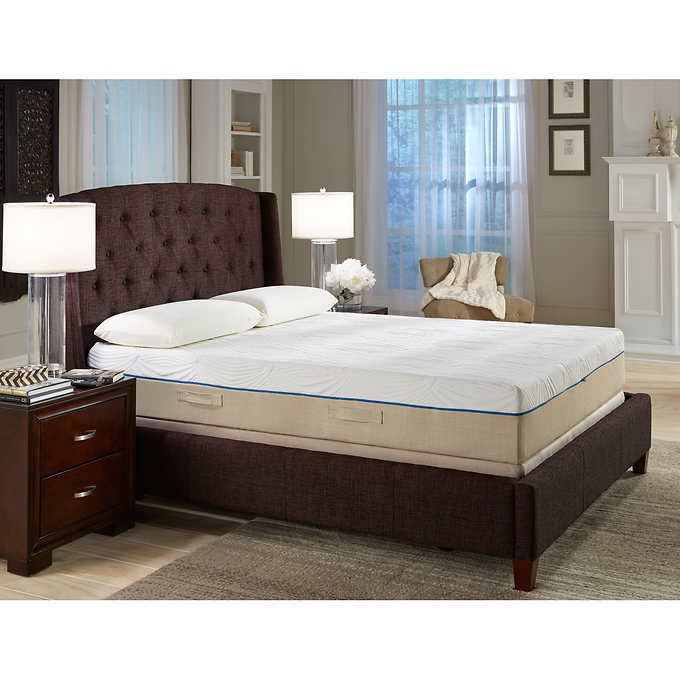 Designed for use either on a flat foundation or for use on an adjustable base, the 10-inch memory foam mattress is manufactured from hypoallergenic and CertiPUR-US certified materials and also comes with a machine-washable zip-off cover, for added convenience. This mattress is a good all-rounder, achieving a level of balance and comfort that should suit most sleepers well. For a comparable bed-in-a-box option that is breathable and appeals to most sleepers, check out our review of the Nectar Sleep mattress. Some research suggests that bamboo charcoal has natural properties that helps neutralise moisture and dissolve odours and the Sleep Science Black Diamond Memory Foam Mattress has been designed to incorporate these features for improved temperature regulation and smell. Described as firm, this mattress is best suited for back and front sleepers who tend to sleep hot or live in warmer climates. The Black Diamond Memory Foam Mattress is constructed from three main components and was produced based on research on the unique properties charcoal can add to a mattress. The top layer of the mattress is made from a 1-inch thick layer of 5-lb density bamboo charcoal infused viscoelastic memory foam, with a second layer of Slumber Tech viscoelastic memory foam, followed by a 2-inch support layer made from latex. The bamboo charcoal memory foam layer is designed to help dissipate odours and neutralise moisture, while the combined memory foam and latex layers provide a supportive sleep surface that relieves pressure points, supports the body, and improves circulation. This mattress also features a 7-inch Air Channel base layer, designed to promote a cooler sleeping environment in which air can circulate easily through the mattress and out the bottom. The Black Diamond range is ideally suited towards back and stomach sleepers and is described as a firm hybrid mattress. Those looking for more cooling memory foam mattress best suited to back and stomach sleepers might also like to check out the Casper mattress. The iFlip Sonoma Dual Comfort Memory Foam Mattress features an interesting reversible design, with a medium-soft side and a medium-firm side that can simply be flipped to suit your preferences. If you find that your firmness preferences tend to change, or you change positions a lot in the night, the versatility of this mattress is a strong contender. This bed is advertised as a California King size, but it should be noted that the beds come in two split mattresses, allowing you to customise your side of the bed without affecting your partner. The iFlip Sonoma Memory Foam Mattress is a reversible memory foam model that is rated as medium-soft on one side, and medium-firm on the other. The mattress is designed to be easy to adapt your how your body changes each day and can simply be flipped for a firmer or softer surface. The construction is simply in reverse for the medium-firm side of the mattress. The outer two layers also include Sleep Science’s patented Wedge feature for improved edge support and minimal motion transfer across the mattress. Some of the key features of the iFlip Mattress include the Air Channel base, which helps to improve temperature regulation to keep you cooler at night. What’s more, the multiple memory foam layers are designed to reduce motion transfer, relieve pressure points, improve circulation, and aid spinal alignment. The iFlip Sonoma Mattress is delivered in the form of two mattresses measuring 36 by 84 inches each to fit a Cal King size bed, so you can adjust the firmness of your side of the bed without affecting your partner. This feature also makes this mattress ideal for use on adjustable bases, as you can adjust your sleep position or elevate your head or feet when relaxing, while your partner can lay flat if they wish. Another great dual-sided mattress designed to provide a more customisable sleep is the Layla mattress, designed to provide a firmer side for stomach sleepers, and a plusher side more suited to side and back sleepers. 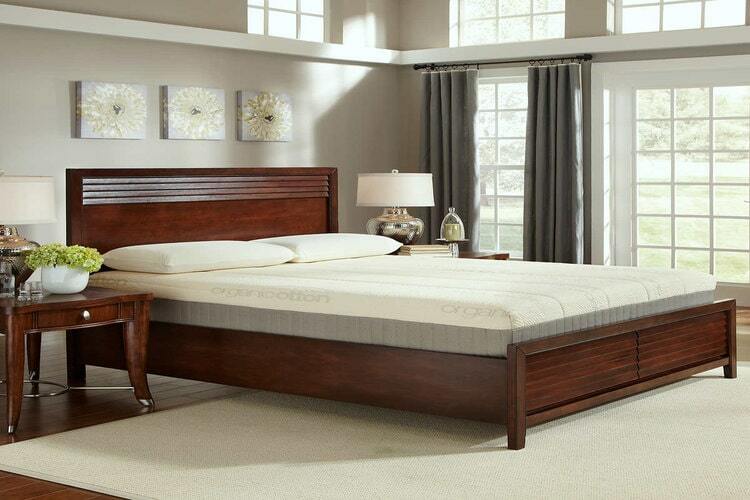 The Layla mattress is suitable for adjustable bases but does not come as a split Cal King. Made from natural Talalay latex, this breathable mattress provides a medium-firm sleep surface with a plush pillow top feel, ideally suited to back and stomach sleepers. If an eco-friendly mattress is important to you, this could be a good option for you. The mattress is also antimicrobial, antifungal, and contains no chemical flame retardants. The Sleep Science Natural Latex Mattress is made from two layers of natural Talalay latex: a 3-inch comfort top layer, and a 6-inch denser support layer. For those looking for a more eco-friendly mattress option, this latex mattress contains no chemicals, synthetics, or other manmade materials. Talalay latex has a number of benefits and has a more consistent cell structure than Dunlop latex, giving this mattress a plush pillow top feel. What’s more, latex is a quick responding material which is great for isolating movement to reduce motion transfer when sharing your bed with a partner. This feature also means you get the same body contouring and pressure point relief as memory foam but without any deep ‘sinking’ feeling. The mattress cover is made from a mix of organic cotton, polyester, and two percent spandex, providing a breathable surface that sleeps cool throughout the night. It is described as medium-firm and ideal for back and stomach sleepers who want pressure relief and support in a breathable mattress that is excellent at temperature regulation. Another fantastic natural latex mattress worth checking out is the Zenhaven mattress, made with natural Talalay latex and an organic cotton cover. The Zenhaven also features two different firmness options on each side to suit all sleep preferences. The Carina 11-inch Gel Memory Foam Mattress features gel-infused memory foam and an Air Channel base for a breathable surface and improved temperature regulation. Its memory foam and latex layers provide a more supportive mattress that’s comfortable and contours to the body for pressure relief, whether you’re a back, front, or side sleeper. The Carina Mattress blends both memory foam and latex components, with three layers that combine to create a luxurious, medium-firm mattress, suitable for back, side, and stomach sleepers. The gel-infused memory foam in the Carina is designed to provide temperature balancing comfort, while the gel and Air Channel base is meant to help air circulation for a cooler sleep surface. What’s more, the latex layer offers supportive, contouring to the body that relieves pressure points, while the premium memory foam adds a pillowy soft, plush feel to the mattress. Rated as medium firm, the Carina Mattress is good for back, side, and stomach sleepers. It has a great balance of support and pressure point relief and a comfortable pillowtop surface that will keep you cool throughout the night. For a comparable medium-firm mattress that is particularly ideal for hot sleepers, take a look at the Casper mattress. Despite being an all-foam bed, the Casper receives excellent ratings for its cooling properties and excellent pressure relief. CertiPUR-US certification: The majority of Sleep Science mattresses are manufactured with CertiPUR-US certified memory foam, which means the foam is free from formaldehyde, phthalates, mercury, and ozone depleters. 20-year limited warranty: Most Sleep Science mattresses come with a 20-year limited warranty. Hypoallergenic: Memory foam is a good option for anyone that suffers from allergies, while the denseness of the foam makes it naturally dust-mite resistant. Off-gassing: As with many memory foam mattresses, the Sleep Science models do report some level of off-gassing for the first few days after unboxing. 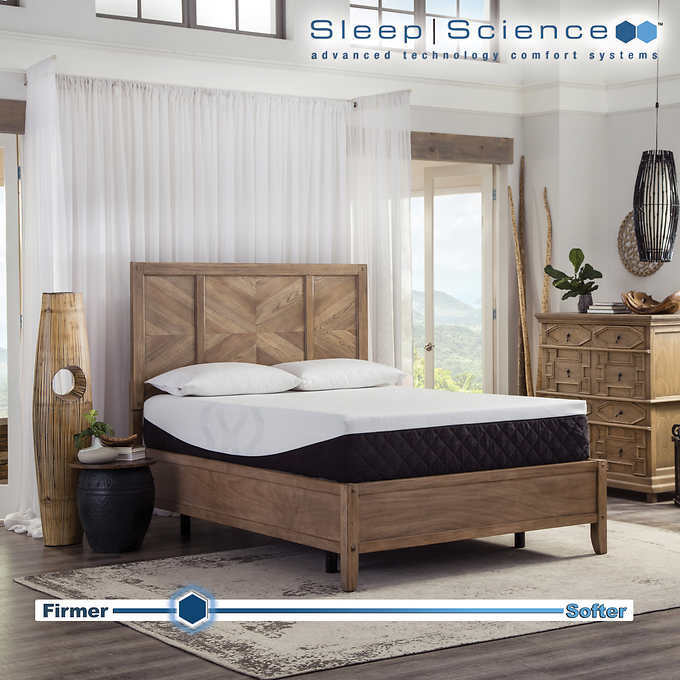 Overall, Sleep Science mattresses tend to be highly rated for their quality materials, comfort, and the support – although some user reviews of certain models suggest that the supportiveness decreases over time. If you are looking for a memory foam or latex mattress that combines a luxurious plush feel with therapeutic pressure-point relief at mostly reasonable prices, the Sleep Science brand offers good value for money and high-quality products. PrevPreviousTrtl Travel Pillow Review 2019: Does This Unique Travel Pillow Live Up To The Hype?